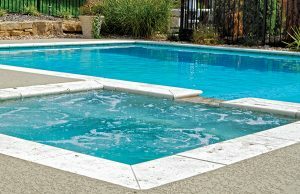 As a new pool owner, we had many questions throughout the project and they were all answered and attended to promptly. The crew was knowledgeable, courteous, and hard-working. We are extremely happy with choosing Blue Haven Pools over the competitors. Reimagine your backyard with the help of Blue Haven Pools St. Louis. Our local office serves the greater metropolitan region, and we build complete inground swimming pools, spas, renovations, and custom outdoor living spaces. A beautiful inground pool with attractive hardscaping can transform your backyard into the ideal place to relax or entertain guests. Our pool designers can help you create a custom layout to maximize your living space while capturing the mood and personality of your home. As a St. Louis pool builder, we are committed to providing high-quality materials and craftsmanship. We take pride in providing our customers with excellent customer service and quality work. In fact, our inground pool company has won several gold, silver, and bronze design awards from the St. Louis chapter of the Association of Pool & Spa Professionals (APSP) for our stunning pools. Our team can create the pool of your dreams with our in-house custom design center. Using professional computer-aided drafting (CAD), our designers can develop accurate, highly detailed plans for your exterior space—or, we can build your pool indoors if that’s what you seek. Our in-house construction team executes much of each installation, including excavation, steel installation, and plumbing. 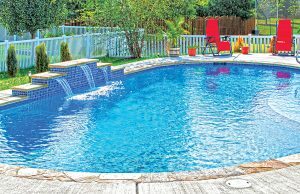 The use of gunite—a special kind of concrete—provides a durable structure for your inground pool. The gunite shell will be finished with your choice of color quartz plaster or PebbleTec® brand Pebble Sheen. You will have many options for decorative features like tanning ledges, fountains, rock waterfalls, cascade water features, and playful mosaic accents. To enhance safety and functionality and help maintain pool-water heat and cleanliness, we also offer mesh safety covers, and automated pool covers. To create your custom pool deck, we offer choice materials such as brick, flagstone, travertine, poured concrete, stamped or decorative concrete, Sundeck®, and pavers. While we specialize in new residential inground swimming pool construction and commercial pools for hotels and motels, we also offer service for existing pools & spas. In addition, we offer weekly pool service, winter closings, and spring pool openings, and we even serve as an authorized Hayward Equipment Warranty Station for repairs. We are committed providing an unmatched level of service. Here in Missouri, our design center has been at our current location since 2006. Owner Mark Trudo is a lifelong St. Louis resident, and with our superintendent, we have nearly eight decades of inground pool-building experience. We are also proud members of the APSP and of the BBB of Eastern Missouri and Southern Illinois, in which we maintain an A+ rating. Learn more about building or renovating a pool and complete outdoor living space. Contact us for a free in-home estimate and design concept.